In addition to new old issues of FANTASTIC FOUR and MARVEL’S GREATEST COMICS, the drug store’s big bin of somewhat older comics had also received copies of a few issues of THE INVADERS, which I picked up as well. This one had a somewhat messy cover–how is it that Captain America is seemingly standing in midair, fighting with Namor? Based on the original, it’s clear tat not only did John Romita ink this piece, but he was called upon to make wholesale changes to it, which would happen in the 1970s from time to time. 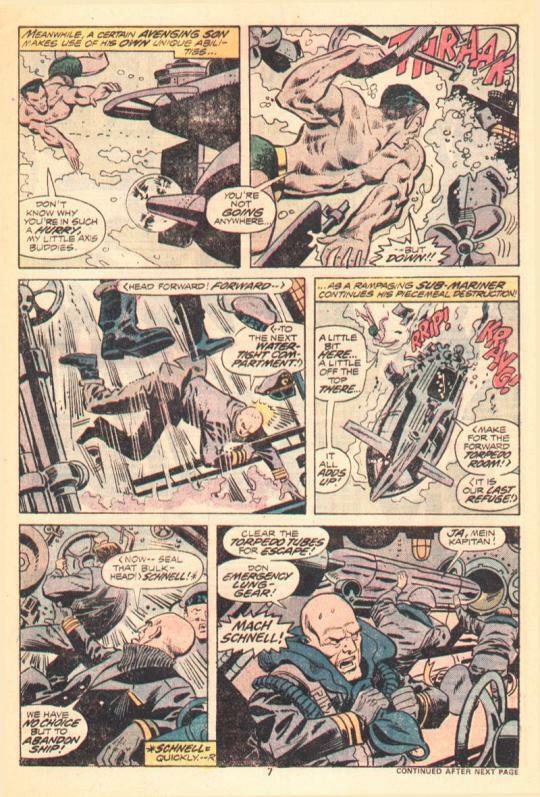 This was another issue inked by Vince Colletta, and while he did sand off some of the more outrageous quirks of Frank Robbins’ art style (it must be said, while he was a great artist, Robbins didn’t really have an instinctive feel for depicting super heroes) he also made it less interesting as well. This was the dullest-looking issue of INVADERS I had so far encountered. It’s become a cottage industry to crap on Colletta, especially where his work over Jack Kirby is concerned, and I don’t want to join in on that bandwagon. But I can only report that I was never a fan of his work and leave things at that. INVADERS was something of a weird comic book, more so today than when it was first published. As a kid, I didn’t have any particular connection to the events of World War II–I knew that such a conflict had happened, but it wasn’t especially relevant to my day-to-day life. And I certainly knew that it was the era in which the earliest comic book super heroes had been created, so seeing them in that context was meaningful. Except, I also knew the outcome of that war, and so it was difficult to care about the stakes in these stories–stakes that I always knew turned out fine in the end. The issue opens with the Invaders returning from the previous issue’s mission, and coming across a U.S. Freighter under attack by a German U-Boat. Leaping into the sea from his flying flagship, the Sub-Mariner makes short work of the attacking sub, while the Human Torch and Toro assist the Freighter’s sailor in putting out the fire on their decks. 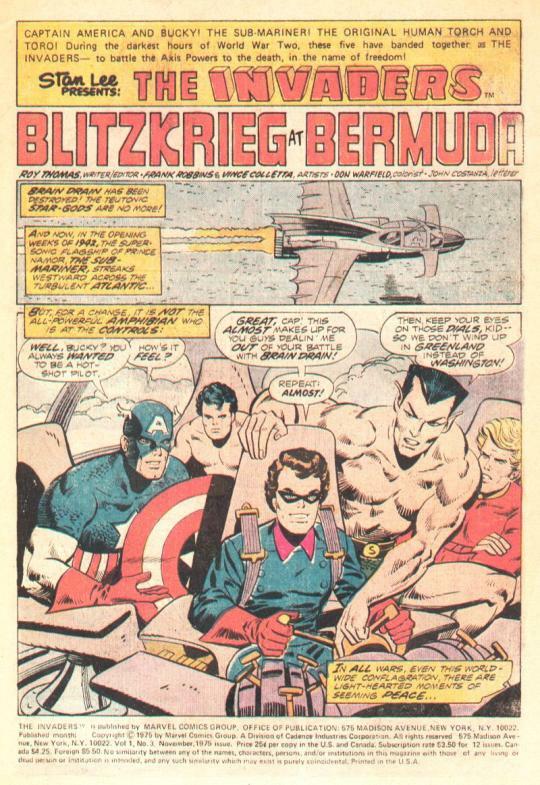 Namor is able to capture the captain of the U-Boat along with a packet of coded instructions that he is carrying, and the Invaders take them back to Washington DC to decipher them. What they discover is that Winston Churchill is going to be returning to the United Kingdom on board a ship in the next few days, and the Axis intends to kill him and sink his vessel, using the power of their new ally, U-Man. 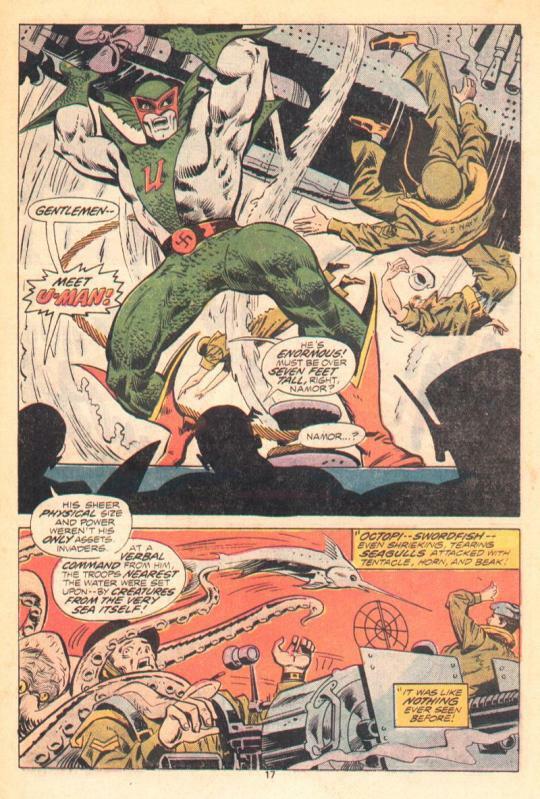 U-Man is a member of Namor’s undersea race, and seeing one of his fellow fall in line with the Nazis pisses Namor off–it was the Nazis, after all, who attacked Atlantis and killed his grandfather, Tha-Korr. 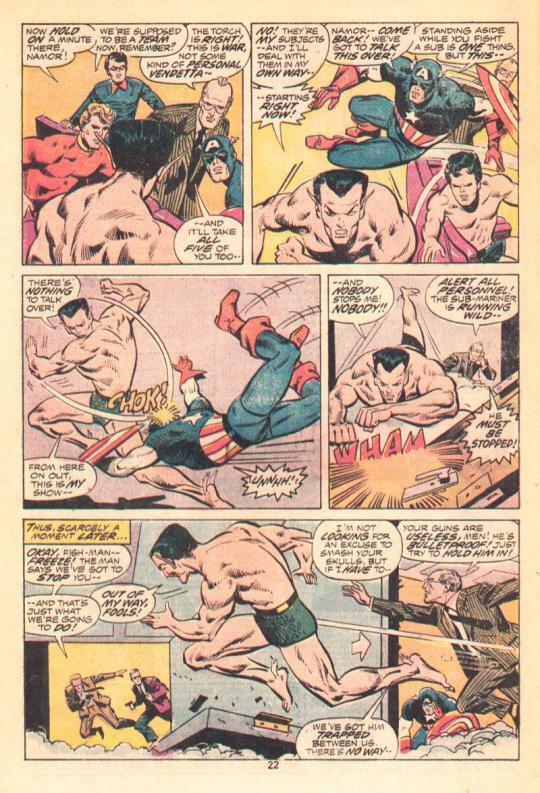 Namor proclaims that the duty of bringing his citizens into line resides solely with him, and when the other Invaders try to calm him down, he knocks them aside like tenpins and bolts from the room. 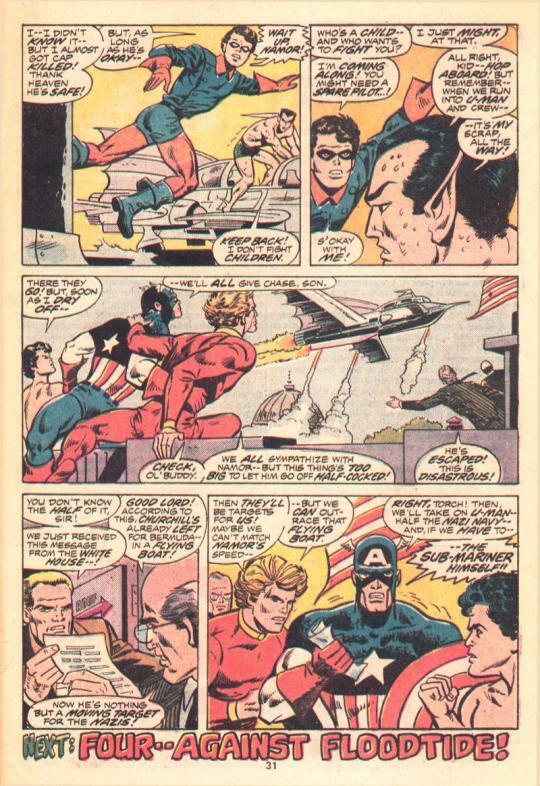 This leads to a pointless all-out brawl between the various Invaders, as the Human Torch and Captain America try to prevent Namor from flying off the handle. 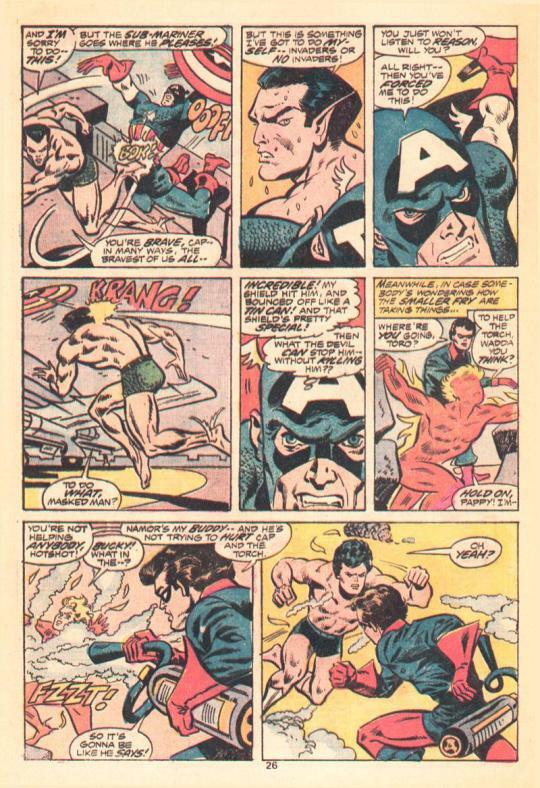 Bucky and Toro mix it up as well, with Bucky coming down on the side of Namor in this argument–no idea how Cap felt about that choice. To make matters worse, a sudden rainstorm puts out the Torch’s flame, and he plummets from the skies. Cap and Toro are able to combine forces in order to catch him before he can splatter on the pavement below, in a rescue that’s both absurd and unbelievable. 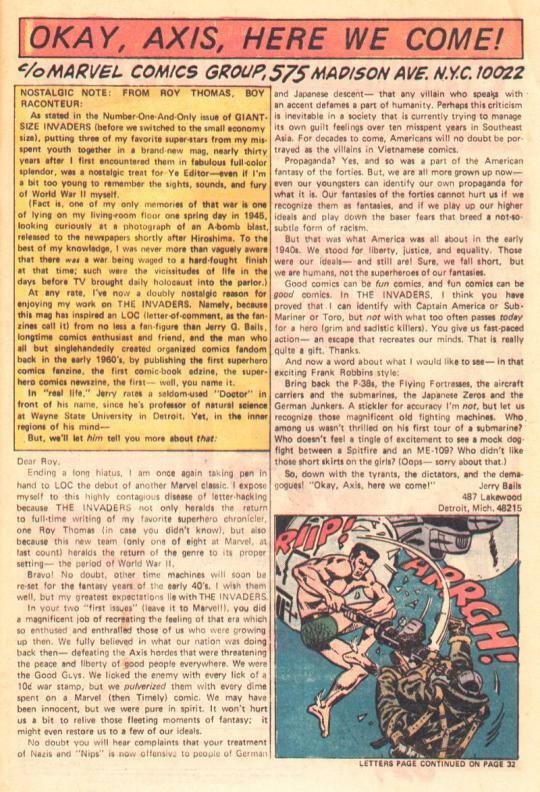 The letters page was devoted almost exclusively to a missive from writer/editor Roy Thomas’ old friend Dr. Jerry Bails. Bails was the grandfather of organized comic book fandom, having created a number of the earliest comic book fanzines, the first comic book awards, and spent years on compiling a massive Who’s Who of creators who had worked in the field.